There is no news on the status of the arrested earthquake aid worker activists after they were transferred out of Tabriz prison. According to reports by Kalameh, the status and whereabouts of the arrested earthquake relief worker activists are still unknown after they were taken by the Intelligence Ministry agents from Tabriz prison. According to reports, human rights activist Hossein Ronaghi Maleki is in dire health due to being physically assaulted and beaten by the Ahar and Tabriz Intelligence Ministry’s interrogators. Also, he, along with other detainees, have launched a dry hunger strike and this has caused Hossein Ronaghi’s recently operated on kidneys to suffer bleeding. Concerns have grown over the health situation of Hossein Ronaghi Maleki, given the fact that the Intelligence and judicial authorities have not allowed him to receive his medication and/or receive treatment. It is noteworthy that an IRGC official has told a relative of Hossein Ronaghi Maleki that IRGC did not approve the arrest of, and was not aware of Hossein’s arrest. He said that the approval of the medical furlough of Hossein was coordinated between IRGC and the judicial authorities and, “since Hossein did not have any suspicious political activities, we gave approval for his medical furlough to be extended three times”. In the end he added that “The IRGC does not approve of Ronaghi’s continuation of detention”. According to the latest reports received by Kalameh (2:30 AM local time, August 23), a number of activists and volunteer rescuers were arrested in the earthquake stricken areas of Azarbaijan. As of this report, the number of people arrested and their status is unknown. All communications with the people reported arrested has been cutoff. In the last contact they had, they stated in case of arrest they will all go on a hunger strike. Prior to the arrests, one of the activists in the camp told Kalameh reporter conflicts started from the time that IRGC entered the scene and decided to confiscate the donations collected by volunteer activists. Amount of donations in this camp was very high and the residents at the camp emphasized they did not have any problem cooperating and working under the supervision of responsible agencies such as the Red Crescent. They even expressed willingness to cooperate and provide a detail report on the distribution of the collected donated items. But IRGC intervened and emphasized that all donations must be turned over to IRGC. He noted that the activists were trusted by they people, and the large amount of donated goods is based on this trust and if the people trusted the government agencies they would not have come to us. We are not willing to betray the people’s trust by delivery their donated goods to IRGC. According to this report, prior to the arrests, there were a total of 10 vans and Peugeot cars along with 50-60 agents stationed in front of the warehouse where the donated goods for the earthquake victims were housed. The Special Units Guards and the Intelligence Ministry’s agents were present at the warehouse, located on Tabriz-Varzeghan road, 4 kilometers from Sarand road, by the plastics factory of Jafar Nezami, where the donated items were warehoused. The forces, on the pretext that the warehouse has heath code violations were attempting to lock and seal the place but met with resistance from the activists and the people on the scene. On furlough political prisoner Hossein Ronaghi Maleki was one of the activists volunteering at the camp trying to help the people in his province. The officials responsible for Ronaghi’s Judicial case were aware of Hossein’s volunteering work and had not voiced any disagreement. Conditions at the volunteers camp in Sarand village has completely changed. From early Wednesday, two police cars with a warrant in hand were there trying to confiscate the donated goods but met with resistance from the people. Previously it was also reported that two groups of volunteer activists, children’s rights activists and psychologist who had gone to help the Azarbaijan earthquake victims were threatened and forced to leave by the Intelligence Ministry’s agents. The government’s reaction to the people volunteering to help the earthquake victims in the absence of proper crisis management by the government was predictable and not surprising given that the people’s solidarity and willingness to mobilize and help their fellow country men echoed around the world. Along with this new development, the earlier arrest of civil activist Saeed Shirzad who had gone to the earthquake-stricken area as a volunteer has increased concerns for the safety of activists not connected with governmental agencies. Also, in recent days there has been reports of confiscation of cars and the goods they were carrying to the victims of the earthquake-stricken areas by IRGC. According to Kalameh reporter, a number of the earthquake victims said one of the IRCG agents stopping and confiscating cars and their goods was taking the items to his personal store. He has since been arrested for this violation. Last week a number of people told Kalameh reporter that much of the donated goods even those donated from Turkey were not distributed among the victims but were taken and warehoused by IRGC. According to witnesses even the Red Crescent employees witnessing this action by IRGC agents just stood by and would not stop them, and when asked by the people about their inaction in this matter they said that IRGC will not allow them. Ahmad Ronaghi Maleki, Hossein Ronaghi Maleki, Hassan Ronaghi Maleki, Amir Ronasi, Rayhaneh Hesami, Vahed Kholosi, Bahram Shojaei, Navid Khanjani, Shima Ghosheh, Misagh Afshar, Farid Rohani, Morteza Esmaeilpour, Hamid Reza Masieian, Ali Mahmoudi, Mohsen Sameei, Masoud Vafabakhsh, Houman Taheri, Daniel Hosieii, Jafar Nezami, Farnaz Ahmadzadeh, Nafiseh Saeidifard, Mohamad Arjomandirad, Esmaeil Salmanpour, Mehri Baghbanbashi, Narges Khirellahi, Mohamad Amin Salehi, Behroos Olomi, Miland Panahipour, Seperdad Saheban, Esmaeil Rafati, Amir Ronaghi Maleki, Zahra Sayadi, Kiana Karimpour and Artimes Varzandeh. The Recent Release Of Political Prisoners, A Distraction Or A Show Of Good Faith? Last week a number of political prisoners were released under amnesty by the Supreme Leader. Last Wednesday, August 15, 2012, according to what Tehran’s District Attorney called “Amnesty by the Supreme Leader” released were; 40 civil activists, 7 convicted of espionage, 5 convicted of blasphemy, 6 journalists and 5 members of the Mojahedin-e-Khalgh (MEK). Along with those released were 9 Ward 350 political prisoners that their sentences were commuted. Among those released, 21 people had only few weeks to a few months left of their prison term, and would have been automatically released after serving out their prison term. Thus, at least in their case, we must doubt the good intentions of the regime for returning to a “more politically open environment” and a “return to a just Judicial system”. Further analysis shows that those who currently remain incarcerated under heavy sentences are those who, despite their incarceration, have issued statements and written letters on various occasions protesting the unjust current situation. These are people who have been deprived of their basic rights such as use of telephone, furlough and face to face visitations. 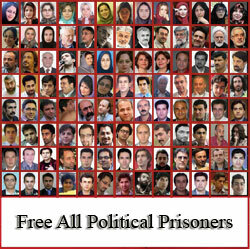 A further look at the political prisoners who remain incarcerated, shows that, in Evin Ward 350 alone, there are 20 political party and presidential campaign activists, 8 journalists and media activists, 15 Student and labor activists, 7 human rights activists, 10 civil and cultural activists, 17 accused of cooperation with Mojahedin Khalgh Organization and 10 election protesters. Many of those who remain incarcerated have not been allowed even one day of furlough, and many have serious medical and health problems whose treatments have either been stopped or continues in a very slow pace. Also, there are a number of women held in the women’s ward at Evin, there are prisoners in Wards 240, 209 and 2-A of Evin, a number of prisoners in Rejaei Shahr prison, and in prisons outside of Tehran, but an accurate number of these incarcerated political prisoners is not available. Also, according to reports obtained by Kalameh from Ward 350 of Evin, where most of the post-presidential election political prisoners are incarcerated, despite earlier claims made by Tehran’s Prosecutor that the political prisoners being released were remorseful and had asked for a pardon, from the moment that their names were announced and they started gathering their belongings until the time they were released from prison at approximately 11:00 PM Wednesday night, not for a moment did the prisoners stop chanting slogans and singing anthems, both those who were being released and those who were remaining behind. All the prisoners together were roaring chants of “Ya Hossein Mir Hossein”, “Neither Eastern, nor Western, a Green National State”. They expressed their solidarity by singing the “O Iran” anthem, they sang “My Schoolmate”, “The Winter Has Ended”. They continued their chants and singing until the last person to be released left the ward. Yet, there still are many people such as Nasrin Sotoudeh, Bahareh Hedayat, Mahsa Amrabadi, Mahboubeh Karami, Amirkhosro Dalirsani, Sayed Mehdi Khodaei, Mohamad Davari, Mohamad Sayfzadeh, Behnam Ebrahimzadeh, Mohamad Sedigh Kaboudvand, Abolfazl Abedini, Sama Nourani, Siyamak Ghaderi, Hossein Zarini, Sayd Mohamad Ebrahimi, Arash Safar, Afshin Osanlo, Alireza Rejaei, Mohamad Hossein Naimipour, Alireza Beheshti Shirazi, Fayzollah Arabsorkhi, Behzad Navavi, Mostafa Tajzadeh, Mohamad Taher Ghavini, Emad Bahavar, Abolfazl Ghadyani, Abdollah Momeni, Bahman Ahmadi Amouee, Siyavash Hatam, Saeid Matinpour, Masoud Pedram, Kayvan Samimi, Sayd Amir Khoram, Abdolfatah Soltani, Isa Saharkhiz, Mohsen Aminzadeh, Hassan Assadi Zaidabadi, Babak Dashab, Majid Dori, Majid Tavakoli, Ahmad Zaidabadi, Heshmatollah Tabarzadi, Rasoul Badaghi, Mohamad Amin Hadavi, Zia Navabi, Masoud Bastani, Mehdi Mahmoudian, Reza Shahavi, Mohsen Mirdamadi, Ahmad Hashemi and Arash Sadeghi, and many more, who are still incarcerated as political prisoners. Many of these prisoners are deprived of their basic right of use of furlough, and many are deprived of needed medical treatment. Families of many of these political prisoners have to wait for hours upon hours and endure harassment and harsh treatment at the Prosecutors officen or at Court in order to request a medical furlough or a face to face visit. An analysis of the prisoners who were released and those who remain behind bars, and a look at the people with short prison terms that were recently summoned to prison, easily shows that the release of these prisoners was just an act trying to show good faith and to distract the public on the eve of the Non-Aligned Movement Summit, from the government’s lack of proper and timely response to the recent earthquake in Azarbaijan, and to distract the people from the current economic pressure on the them. Branch 36 of the Court of Appeals has upheld the 10 year imprisonment sentence of Omid Kokabee. According to reports by Jaras, Kokabee’s lawyers have not been allowed to visit with him. The judicial process in Kokabee’s case contained many discrepancies that, each one alone, should have warranted a mistrial and removal of the judge in the case. After 15 months in prison under temporary detention, Omid Kokabee, an Iranian physicist and doctoral student at the University of Texas in Austin, was sentenced to 10 years imprisonment, accused of conspiring with foreign countries against Iran. Kokabee was tried and convicted in a trial of 13 people accused of “spying for Israel”. In February 2011, Omid Kokabee was arrested at the airport in Tehran as he was attempting to return to the United States to continue his studies, on charges of “communicating with a hostile government” and “illegitimate/illegal earnings”. Kokabee’s lawyer, Saeed Khalili, calls his client’s charges Irrational and unfounded and says he was not allowed to speak with his client in court. Step by step escalation of extremely harsh treatment of the political prisoners in Evin prison continued with lashing of some of the political prisoners and summoning to prison the people whose sentences were issued long ago, entered a new phase during Ghadr nights in Ramadan (The assassination of Imam Ali that is mourned by the Shiits). torturous lashings during the most sacred nights in the month of Ramadan. Also, Majid Sadeghinejad had received his lashing sentence last week. Although, in the past, the lashing sentence of many of the people were not implemented, in consideration of the dignity of the political prisoners, and the Judiciary itself knowing very well that such sentence is baseless. However, this policy change reflects the continuing crackdown on the political prisoners. A process that started with arrests, illegally keeping prisoners in solitary confinements for long periods of time and torturing of the prisoners, continued with Stalinist show trials and giving out of heavy sentences. This new policy toward prisoners entered a new phase with a ban on phone calls, visitation restrictions, furlough restrictions, and periodical solitary confinement in Ward 240. Now this new phase continues with carrying out of the lashing sentences that were not previously implemented, and whereas previously the judges that had issued a lashing sentence would sometimes inform the political prisoner that this was done in lieu of a longer prison term, knowing that the lashing sentence would probably not be carried out. Also, reports indicate that many people, who had been sentenced a long time ago to prison terms of six months to six years, and were out on bail, have now been contacted by Evin prison and summoned to start their sentences, and informed failure to do so would cause the seizure of their bail by the Judiciary. In a tangled and complex web of judicial process, incarcerated political prisoner Gholamreza Khosravi Savadjani, who was arrested in 2006 on charges pressed by the Intelligence Ministry’s office in Rafsanjan and sentenced to six years imprisonment, is now under the death penalty after new charges of collaboration with the Mojahedin Khagh Organization (MKO/MEK) were pressed by the Defense Ministry. After much back and forth between various courts, Khosravi’s death sentence was upheld by the Supreme Court and he was recently verbally informed by the Judicial officials at Evin prison that his execution date had been set for September. In the recent years, the date that a death sentence is to be carried out, and even the final verdicts, are not officially given to the prisoners, and the death row prisoners are executed without prior notice to their families or their lawyers. Golamreza Khosravi was previously arrested in 1981 at age 16. He was released five years later after serving out his prison sentence. Khosravi was arrested again in 2007 on charges pressed by the Intelligence Ministry for donating money to Mojahedin Khalgh Organization (MKO/MEK). During his incarceration and after going through interrogations, Khosravi endured much hardship in various detention centers under harsh conditions. He was incarcerated in solitary confinement for a total of forty months. He was incarcerated for 20 months in solitary confinement in Kerman prison and after the Defense Ministry pressed charges against him, he was incarcerated for 10 months in solitary confinement in the Defense Ministry’s prison No. 64. He also was incarcerated 10 months in solitary confinement in IRGC’s intelligence Ward 240 in Evin prison. This political prisoner, a welder by profession, has been under tremendous pressures during incarceration to give a televised interview. It appears that his death sentence was based on confessions obtained under pressure and torture. The legal process of Khosravi’s case was in itself unique and unprecedented. Initially, he was sentenced to six years imprisonment, based on confessions obtained under duress, but in a retrial in Tehran, he was convicted of Moharebeh charges (enmity against God) and was given the death penalty. Khosravi was initially sentenced to 3 years imprisonment plus 3 years suspended for a five years sentence by the Revolutionary Court in Rafsanjan, presided by Judge Sayed Mohamad Bagher Khorshid. Upon appeal by the Intelligence Ministry, a court in Kerman over ruled the previous sentence and gave Khosravi six years imprisonment. While Khosravi was in prison, his case entered a new phase by the Defense Ministry pressing new charges against him based on confessions obtained under duress. He was then transferred to the Defense Ministry’s prison No. 64 after having already spent 20 months in solitary confinement. After enduring a long period of interrogations, Khosravi faced a death sentence in a trial on November 29, 2010, in Branch 26 of the Revolutionary Court presided by Judge Pirabbasi. Judge Pirabbasi ruled the case beyond the scope of his court’s jurisdiction since a ruling was already issued by another Revolutionary Court in a different city. This last verdict by the lower court was also overturned by the Supreme Court on technicality and was sent back to Branch 26 for retrial which ultimately resulted in a death sentence for the defendant in November of 2011. On April 21, 2012 the Supreme Court upheld the death sentence for Khosravi and forwarded the case to the Implementation Division in Evin prison. Lawyer Hedayat Rezaei defended this case in Rafsanjan court. Lawyers Abdolfatah Soltani and Shima Ghosheh are the other defense attorneys that defended this case in Tehran. But with the arrest and imprisonment of Abdolfatah Soltani, and considering the pressures that the attorneys are under by the Intelligence entities, the defense attorneys’ efforts for a new verdict have been to no avail in this case.